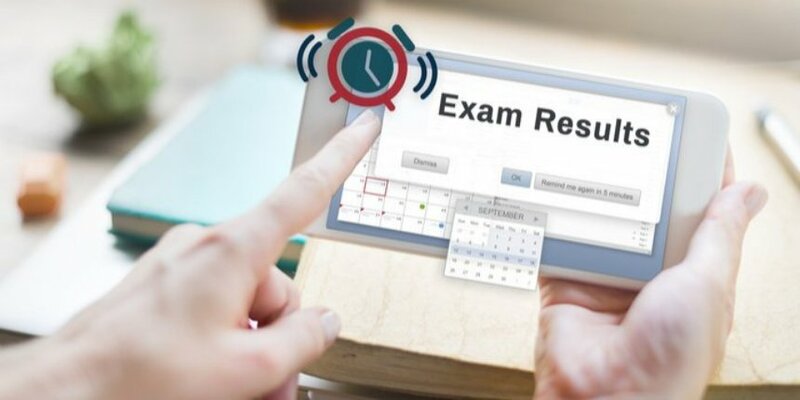 NIOS Result 2019 – National Institute of Open Schooling (NIOS) will release NIOS result for Block I exam in the first week of June, 2019. Candidates will be able to check the result of NIOS 2019 by entering their 12 digit enrolment number in the login page. The link to check the NIOS result 2019 will be provided below after the declaration of official result. The NIOS 10th and NIOS 12th practical exams were conducted from March 16 to 30, 2019 and theory exams started from April 3 and April 2 for class 10 and 12 respectively and will end on May 4. Last year, the examinations for 10th and 12th were conducted between April 4 and April 26 and the NIOS 2019 result was announced on June 1 and 4 for classes 12th and 10th respectively. Read the entire article below to know more about the result of NIOS 2019, steps to check it and more. The NIOS 2019 Block II exams will be conducted in the month of October-November, 2019 and the result for the same will be released in December 2019. Given below are the important dates related to NIOS 2019 exams and result. Candidates must keep this calendar handy till the result of NIOS 2019 is announced. The NIOS exam dates 2019 for block I (April exam) has been released on February 27, 2019. Please note that the dates provided below. Click on "Secondary and Senior Secondary" under section Result as shown below. Click on Public Examination Result as shown below. Take a printout and keep it safe for future reference. The following details are mentioned on the result of NIOS 2019. Candidates must check for any discrepancy and inform the NIOS officials immediately about it. The candidate can apply for re-evaluation of the answer script in any subject within 15 days from the date of declaration of the result. An application may be made online or apply to the Regional Director of the concerned Regional Centre, NIOS on a plain paper or in the prescribed Proforma for Re-evaluation of the Answer Script (Proforma can be downloaded from the NIOS official website). The candidate has to pay fee of Rs 800 per subject to the NIOS through Credit Card/Debit Card/Net Banking or through Bank Draft drawn in favor of the Secretary, NIOS, payable at the concerned Regional Centre. This facility is available in theory marks only. The original mark sheets will be provided within a few days after the declaration of online result of NIOS 2019. In case students find any discrepancy in result, they may apply for correction within 30 days from the declaration of NIOS result 2019. The students should apply to the Regional Director of his/her region. No request for correction in the results will be entertained thereafter. The proforma for application for correction in the record is available on NIOS website under Student Information Section. NIOS allows the candidate to apply again in a subject which he/she has already passed for improvement but only once in Public Examination. Candidate can apply for improvement for appearing in the first examination by paying the required fee. This chance can be availed only once in each subject within five years from the year of admission in Public Examination. For subjects involving practical, the candidates will have to appear in both theory and practical for improvement. The better of the two results will be considered and included in mark sheet. NIOS will issue only Mark Sheet if he/she is already certified. In the case of ODES (on demand examination system), a candidate can appear as much time for improvement till his/her satisfaction. But, they cannot appear in the ODE in a particular subject twice in the same month. in case of non-receipt of print out of internet received application form within the stipulated time. in case the fee paid is short. in case the documents are not complete and if false documents are submitted. if required educational qualifications are not fulfilled and the minimum age criteria is not fulfilled. if the residential proof is not attached. Note: Admission once cancelled will not be reconsidered and the fee will not be refunded in such cases. Candidates appearing for NIOS block I exam must download, solve and analyze NIOS question papers to know the exam pattern and marking scheme followed in the exam. With these, they would also come to know the types of questions that do rounds in the exam every year. Candidates can find question papers of Class 10th and 12th on the link provided above. One must keep the admit card ready before beginning to download the NIOS 2019 result. 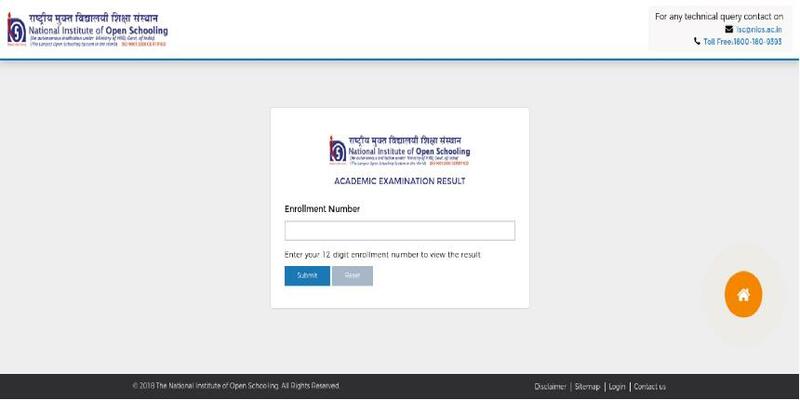 The login credentials entered should be exactly as mentioned in NIOS 2019 admit card. 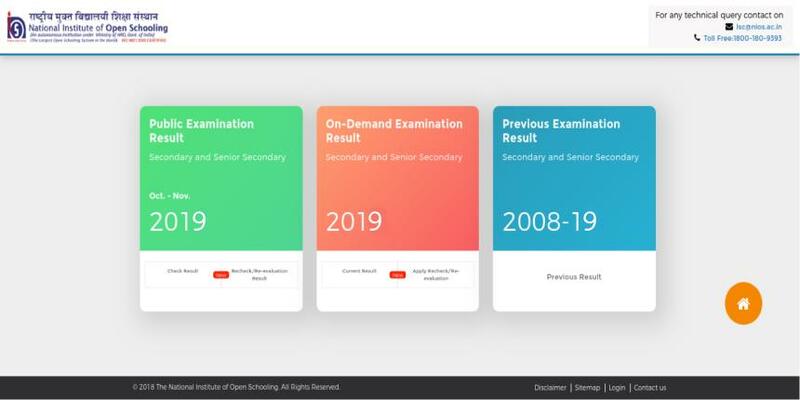 As stated earlier, NIOS result 2019 published online and downloaded is provisional. It is meant only for information to candidates. Candidates will be required to collect the original copy. The respective Accredited Institute (AIs) of NIOS will issue original mark sheets and other documents to candidates soon after the result of NIOS 2018 is declared online. Students have to visit the respective AIs in person to collect the same. The certificates provided by NIOS are equivalent to the certificates provided by any other Board of School Education such as Central Board of Secondary Education (CBSE) or Council for Indian School Certificate Examination (CISCE). 1) How can candidates check the examination results? Ans - Candidates can check the NIOS result online available on NIOS website and on mobile phone through SMS as well as at the AI (Academic Study centres). The result will not be dispatched offline in any case. 2) If a candidate has passed the Secondary Examination from NIOS, can they take admission in class 11 from any other Board? Ans - Yes, all the Boards including National or of States as well as NIOS follow the National Curriculum Framework (NCF) -2005 which was brought out by NCERT, hence, the students passing the secondary examination from NIOS students are eligible to take admission in Class XI of any other Board. 3) Is NIOS Board valid for the government job or entrance level exams like IIT JEE, PMT? Ans - NIOS is recognised under the MHRD, the government of India which makes the courses or certification done through this board valid throughout India for registering to any competitive exam that students take after clearing their class 12th exams. They can apply for any job whether in government or private sector. 4) If a student fails in one or two subjects, do they need to appear in all the subjects again? Ans - No, the student only needs to appear in subjects which are yet to be cleared (SYC). 5) If a candidate has passed the Senior Secondary examination from NIOS, are they eligible for admission to Universities and Professional Colleges? Ans - Yes, NIOS students who fulfil the eligibility criteria of a particular university or college can take admission there. 6) At the Senior secondary level, if a student fails in the theory exam but passes in the practical exam, are they required to appear in practical exam again? Ans - No, If a student has passed in the practical exam but failed in the theory of that subject, their practical exam marks will be retained and they must appear again only in the theory papers. 7) If a student is not satisfied with the score or marks obtained in a particular subject can their performance in that subject be improved? Ans - Yes, they can apply for improvement only once in public examination and as many times as they want in On Demand Examination during the validity of their registration. 8) What is the procedure for obtaining the duplicate Marksheet/ Certificate from NIOS? 9) How do students obtain their result documents – Mark-sheet/ Certificate etc.? Ans - The Mark-sheet and all the other documents are sent to the mailing address of the individual student by the concerned Regional Centre. 10) What is the procedure for correction in the result? Ans - A student if finds any discrepancy in the result may apply for correction within 30 days of the declaration of the result to the Regional Director of their respective region. The proforma of the application for the same is available on the NIOS website under Student Information Section. 11) Can students also apply for re-evaluation of answer scripts? Ans - Yes, NIOS also provides the facility of re-evaluation of answer-scripts only at the Senior Secondary level in theory papers. The student needs to apply for re-evaluation in any of the subjects, within 15 days from the date of declaration of result, either on a plain paper or in a prescribed proforma along with the processing fee of Rs.500/- per subject (for public examinations) which is to be paid through bank draft drawn in favour of the Secretary, NIOS at the city of concerned Regional Centre. The proforma for re-evaluation is available at the website. 12) How can students apply for rechecking of answer scripts? Ans - NIOS provides an opportunity to the students to apply for rechecking of answer scripts in which retotalling and evaluation of left out part are done. The student needs to apply for rechecking within 15 days from the declaration of results along with the prescribed fee of Rs.200/- (Rupees two hundred only) per subject which is to be paid through bank draft, drawn in favour of Secretary, NIOS. 13) Can a student also apply for re-checking and re-evaluation for Practical exams? Ans - No, NIOS only provides the re-checking and re-evaluation facility for theory papers. 14) When the results of re-checking and re-evaluation are declared? Ans - The result of re-checking and re-evaluation is declared within 45 days time after the last date of application. 15) When the Result Withheld (RW) cases are considered or decided and how to know the status for the same? Ans - RW cases are decided after 40 to 60 days time from the declaration of the main result. The final decision is displayed on NIOS website and a communication regarding the same is also sent to the student concerned. 16) Is there any relaxation given to differently-abled persons in practical exam also? Ans - No. they are only considered for theory examinations. NIOS has released the NIOS registration 2019 form for classes 10 and 12 (Stream 1, Block - II) along with Stream 2, Stream 3 and Stream 4 in both online and offline mode. Students can fill NIOS admission form from September 16, 2018 to January 31, 2019 without late fee and March 15 with late fee. In order to fill the form, students have to enter their personal, communication and educational details after NIOS registration 2019.